Here we are lined up with the field for the Blessing of the Hounds. What you can’t tell from the photo was that it was freezing out! In September the fall season stretches ahead and the possibilities seem infinite. Thanksgiving is a long way off and the weather is more like summer than winter. Now, as the season winds down I’ve had to break out my heavy weight Melton and brace against the winds. 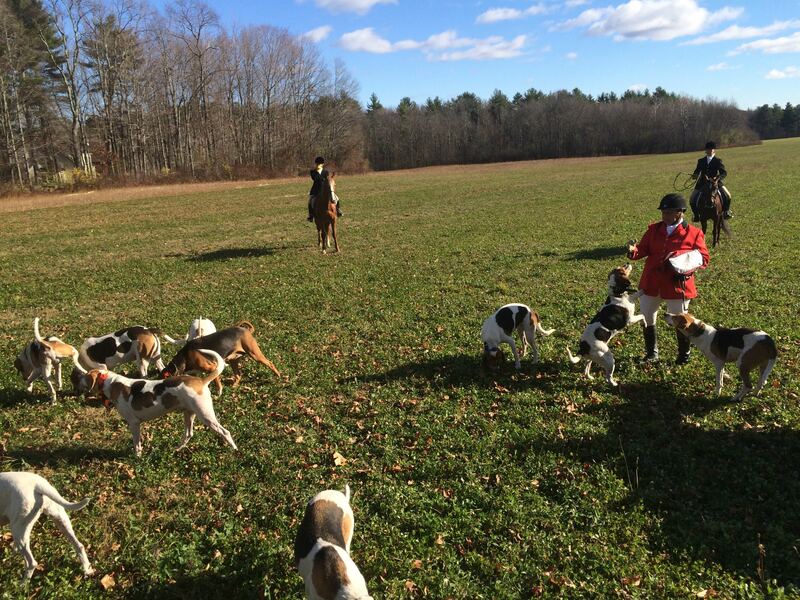 Saturday was the annual blessing of the hounds and when I woke up it was barely 20 degrees and there was a stiff wind. 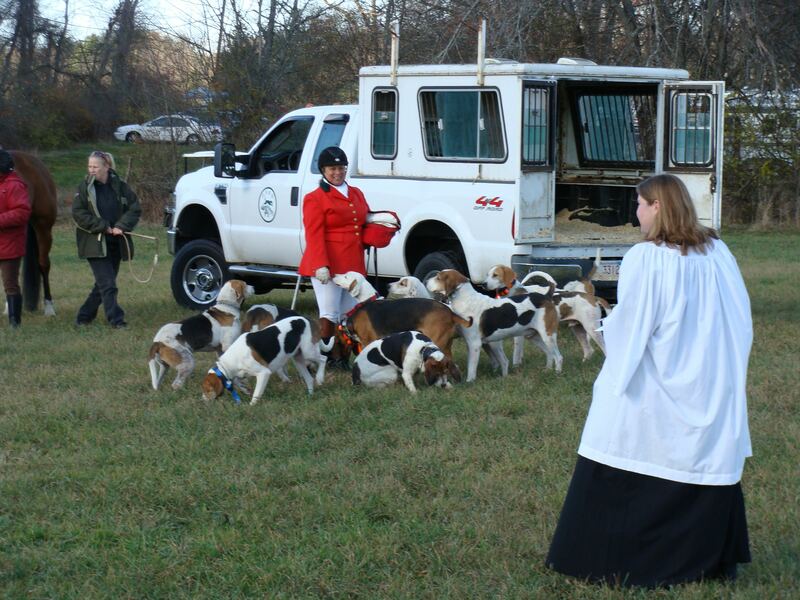 The blessing of the hounds is a centuries-old tradition of blessing the animals and humans involved in a the hunt. The blessing practice was brought to the US in the 17th century but it dates back to the 8th century and to celebrations associated with St. Hubert, the Patron Saint of Hunters. The hounds are about to be blessed. 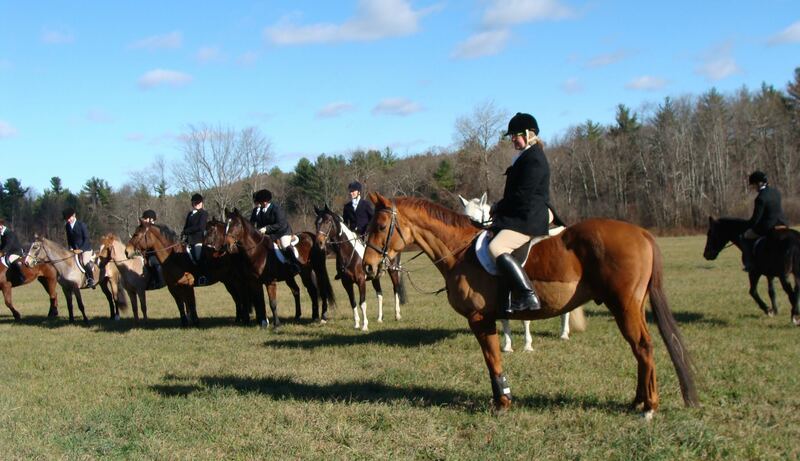 Each year our hunt invites a clergy member, priest — or even a Native American Shaman — to the ceremony to recite prayers and bless the huntsman, hounds and horses. Each huntsperson is then awarded a medallion with the image of St. Hubert. Some years we’ve had very elaborate blessing ceremonies; this year, the weather kept it short. The ceremony was held in an open field and the wind made the effective temperature in the teens. I think we were all thankful to get moving so that we warmed up a bit! The hounds at the first check. Once we got moving, we all warmed up and the sun came out. 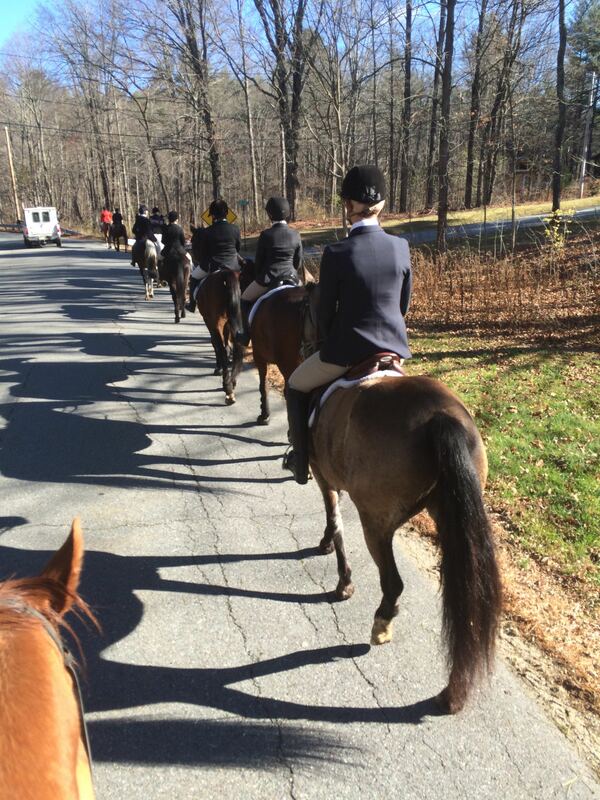 Considering the brisk wind and temperatures the horses were all well behaved; at last Tuesday’s hunt there must have been something in the air because despite the warmer temperatures, there was a lot of bucking and misbehavior. One horse also stepped in a hole, falling to the ground and nearly landing on her rider. That’s one of my greatest fears out hunting. It takes a lot of the pleasure out of galloping through an open field. But Saturday’s hunt was uneventful. Freedom complained that it was too slow — he likes the galloping and the open fields were inviting. He settled for jigging and bouncing with a few leaps in the air for good measure, but he was quite well behaved considering. Unlike Zelda, who tries to sneak in some bucks, Freedom never intentionally misbehaves; you can’t say that he’s naughty. He just can’t contain himself. The best thing to do is just ignore the behavior and ride through it. Saturday’s hunt included some lovely open fields. It was held in a town called Pepperell which was first settled in 1720. It’s far enough away from Boston (right on the New Hampshire border) that it has a lovely rural feel to it. Of course all the warmth generated by the hunt dissipated as soon as we got back to the trailers and back into the wind. It was wonderful to retreat into the antique farmhouse (circa 1790) and enjoy the hunt tea in front of a roaring fire! 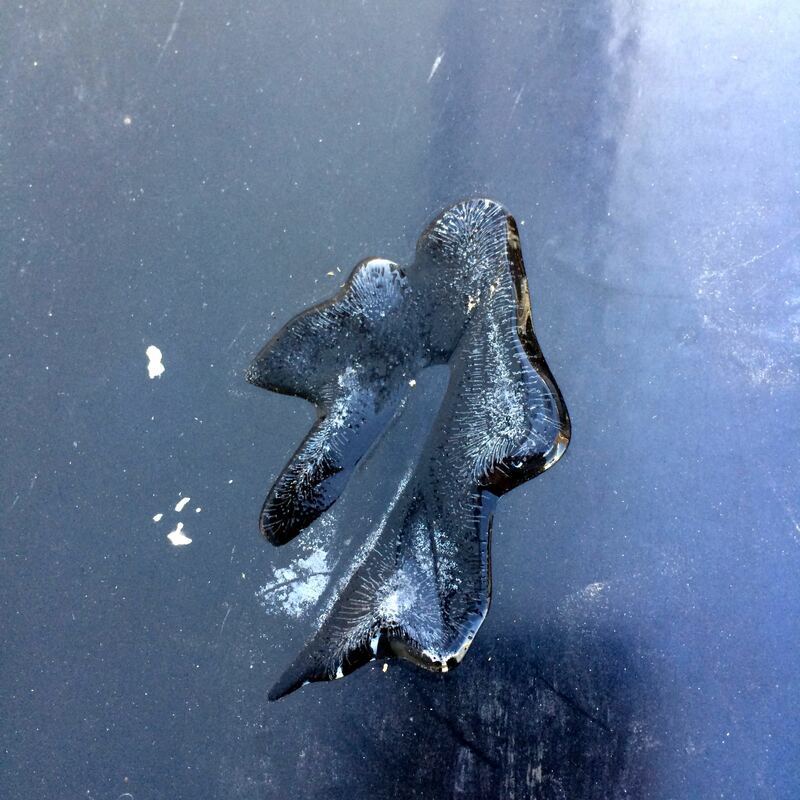 This frozen leaf — just ice, no longer any actual leaf — was on the fender of my trailer. It was that cold!